by Stephanie Liebergen | December 30, 2011 – KSHB CHANNEL 41 NEWS: If you one of your New Year’s resolutions includes weight loss, consider trying something new to reach your goals. At Learning2Fly in Mission, Kan., you can take classes in aerial yoga. They offer a variety of non-traditional fitness classes using props like fabric hammocks and hula hoops. MISSION, Kan. – If you one of your New Year’s resolutions includes weight loss, consider trying something new to reach your goals. At Learning2Fly in Mission, Kan., you can take classes in aerial yoga. 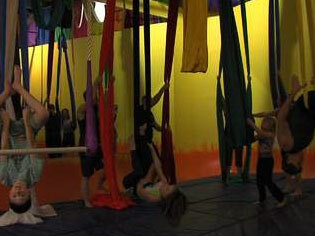 They offer a variety of non-traditional fitness classes using props like fabric hammocks and hula hoops. Owner Sumya Anani says their unique ways definitely make exercise more fun. “People get bored of the treadmill, and they want to try something new. We’re always looking for the next thing, and this is such a way to empower you, not just physically but mentally. You start doing things you never thought you could do,” Anani said. There are a variety of class types for all age and fitness levels. Anani says some people can start see results and improved fitness after just a couple classes. To learn more or see a class schedule, go to iamlearning2fly.com or visit their Facebook page .